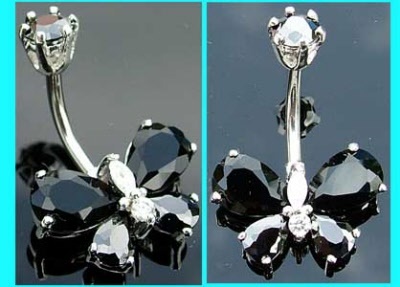 These crystal belly bars feature a sterling silver butterfly design which is set with black and clear stones, and have a matching black jewelled top ball. This surgical steel belly bar is available in a 6mm, 8mm, 10mm or 12mm size. The butterfly design on this belly button bar measures 19mm x 12mm (approx), and if you have a sensitive piercing, we also stock this design with a titanium barbell. These navel bars are also available with clear, sapphire blue, light blue, light pink and rose coloir jewels. Powered by ShopFactory to sell P12252 online. All-in one eCommerce and online shopping cart software.